How Much Are We Using? Back in the 1600’s and 1700’s, Montrealers fetched their water from communal wells, public fountains, and directly from the streams and rivers that flowed through and around the island. It is estimated that each person used about two bucketfuls (10-17L) per day, compared to the average of 329 L uesd daily by each Canadian today. In 1819, Montreal began to draw water directly from the St. Lawrence River, and this continues to be the source of drinking water for many Montrealers. 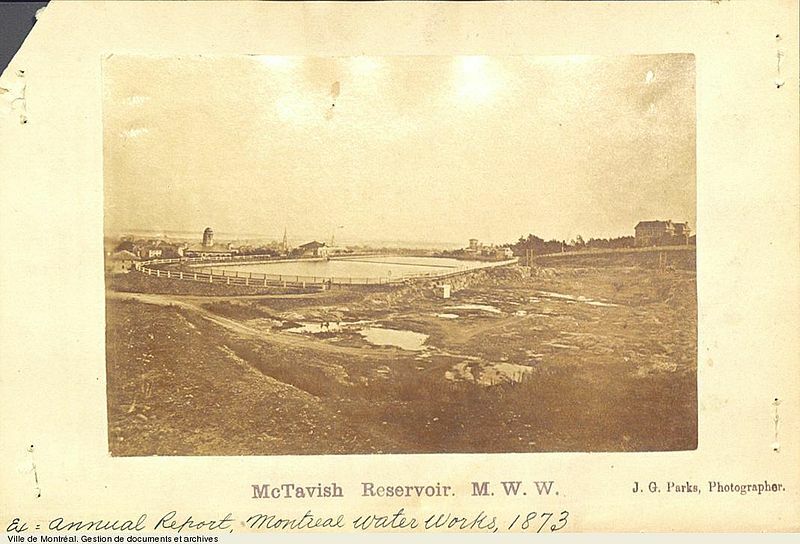 In 1856, the city developed three key parts of its water processing complex: the canal de l’Aquaduc, the Atwater pumping station, and the McTavish reservoir. This last is just up the hill from McGill’s downtown campus, at the corner of McTavish Street and Pine Avenue. Following an outbreak of typhoid fever in 1910, the city decided to build its first drinking water treatment center at Atwater. Inaugurated in 1918, the Atwater plant has been going strong ever since. In 1978, a second large plant — the Charles J. Des Baillets water treatment plant — was built in Lasalle. These two are the largest of Montreal’s seven water treatment plants. Both the Atwater and Charles J. Des Baillets treatment plants draw water from the Saint Lawrence. The main inlet is located upstream of the Lachine Rapids, 610m from shore, where the water is well oxygenated, and turbidity and microorganism counts are low. The main inlet can provide up to 2,160,000 m3 of water daily. When water demand increases above this volume, an auxiliary inlet is also used. Water is pumped directly from the Saint Lawrence into the Charles J. Des Baillets plant. Water reaches the Atwater filtration plant via the Canal de l’Aqueduc, an 8-km-long canal that runs south of the Lachine Canal. At the Atwater plant, the water is filtered through screens to remove sediment and large pieces of debris such as wood, fish, and other detritus. The water is then filtered through a bed of sand about a metre thick, which traps particles suspended in the water, as well as 85% of bacteria present. At the Charles J. Des Baillets plant, an ozonation process further disinfects the water. At both the Charles J. Des Baillets and Atwater plants, a small amount of chlorine is added as a final measure to deal with any remaining bacteria and viruses, and to prevent bacteria present in pipes from proliferating. Photo: Canal de l'Aqueduc. Jeangagnon. Wikipedia.org. Creative Commons Attribution-Share Alike 3.0 Unported license. Finally, some of the water is pumped directly to parts of the city and the rest is pumped up to the six reservoirs on Mount Royal. These reservoirs, located at the highest point in the city, act as giant water towers. They distribute water throughout the central and eastern parts of Montreal using gravity to move the water through a network of pipes that covers over 5200 km. The city tests samples of water throughout this network to ensure that the quality remains up to standard at all times. If needed (e.g., generally during the summer), additional chlorine is added at key points in the network. McGill receives its water from the reservoirs on the Mountain: our water flows through a network of primary and secondary mains into our campus buildings, and from there we use it for everything from drinking and flushing toilets to producing the steam that heats many of our buildings. Looking for more information on how Montreal treats our drinking water? Please see the City of Montreal site, including a great schematic of the pumping stations and reservoirs around Mount Royal (in French).